You can have fantastic kitchen renovations at friendly pocket pinch. However, for that you need to know about the styles, designs, materials, brands, different looks that can completely transform your kitchen without charging you too much. A bit of imagination, research, DIY efforts can turn your old, shoddy looking kitchen into a brand new one. Although, it might give a feeling that you have spent a lot, you may have spent only a few bucks. Get a fresh paint for the drab wall. A pretty paint is what can change the whole look. Add white beaded boards and paint the cabinets with bright colors to add more to the look. Do not forget to give a fresh coat of paints to stools and chairs so that the old look can be completely transformed. Retain the design layout that is already there. 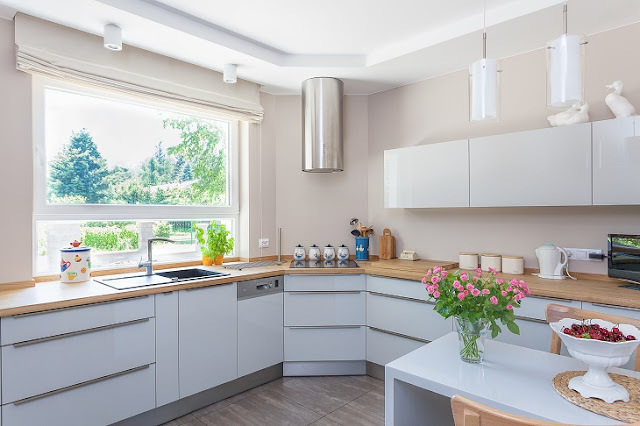 Whether it is a one-wall outlet or L-shaped kitchen or a U-shaped kitchen; all that you need to do is spruce up your things so that the space looks new. The trick lies in arranging the dining area in the kitchen and adding extra stools or excluding it if necessary. Get savvy storage tips from experts, since it can change a lot of how your kitchen looks. You may opt for a base cabinet or go for more countertop spaces. If possible shift the refrigerator in your drawing space, so that you will get more space in your kitchen. However, if you want the refrigerator within the space then install open shelving around it. This will imply more storage enabling you keep dish wear within your reach. Improving space function helps in remodeling a kitchen area. If you have a small kitchen and if there is empty space then add cabinets in there. This is indeed a fabulous addition since it can hold an extra microwave oven and also a small refrigerator. Also the tops will furnish essential space that will help a lot. Why not have a gorgeous and trendy looking gallery kitchen. Make a few simple additions to your existing kitchen space and you will have a budget-friendly idea. Add a few decorative items, install new cabinet hardware, and add glass panels, fresh paints on cabinets, neutral color palette, and so on. The right style and ideas will add much to kitchen remodeling. When you think of the floor, think ‘functional’. It means that the floor should resists any kind of spills and so choosing tile or vinyl sheet is a great idea. You can opt for do-it-yourself installation idea. It would also be a better idea to choose ceramic tiles than high-end hardwood. Choose for styles that will look good and at the same time make it budget-friendly. Opt for off-the-rack cabinetry storage. You can get the best choices from the internet. Choose off-the-rack cabinetry from the online stores and you can also compare the prices for a good deal. Remember that a complete rewiring project in the kitchen can augment the cost. If your existing kitchen is absolutely safe and can carry the load, then there is no need for change. Remove some of the power sucking appliances, such as, double-ovens, ancillary appliances and replace them with low power-driven appliances. This will help add new look to your kitchen and at the same time save you on budget. It is advisable to opt for the effective and modest countertops. Choose a countertop that looks great but you are not aware of can eat up your budget. Therefore, choosing stone and stainless steel are two great options. Try to avoid any type of permit since that can heat up the cost. For instance, you can put up tile floor but installing radiant heat under the tiles will increase the chance of permit. Therefore, enjoy kitchen renovations but with these exclusions. Now that you have some wonderful ideas furnish your kitchen but keep it within budget.